Adam Haas Hunter, Jarrod M. Smith and Charlie Robinson in THE WHIPPING MAN. Photo by Jordan Kubat. Since Kristen saw The Whipping Man at South Coast Rep last month, last night I (me, Lindsey Anthony @rewindrevise, hello!) had the pleasure of seeing the Obie-award winning drama at one of my favorite theatres in Los Angeles - the Pasadena Playhouse. 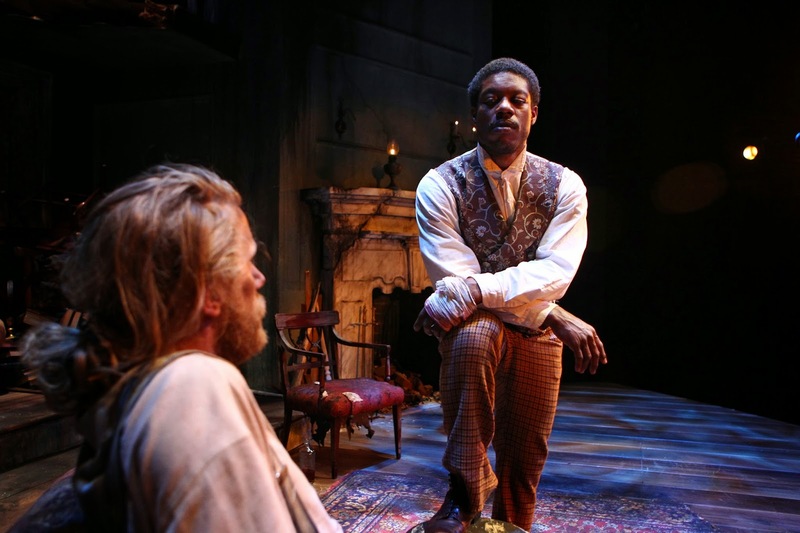 I could not agree more with Kristen's review - the acting is superb especially the powerful performance by Charlie Robinson as Simon, the play inspires several existential questions, and the stage production is beautifully haunting, echoing a torn apart family in a tattered nation in the aftermath of the Civil War. In short, Caleb (played by a compelling Adam Haas Hunter), a Confederate Captain who returns home with gangrene and without a pardon is taken care of by Simon (Robinson) and John (played by a very energetic Jarrod M. Smith), two of his former slaves, now freed. Although Simon and John were raised in household and with the family in the Jewish faith, it is revealed both still suffered at the hands of "The Whipping Man" when too chummy or comfortable with the family. While the three men struggle with the dynamics of their new relationship, it is unclear if they will ever be freed from the grips of the past. Adam Haas Hunter and Jarrod M. Smith in THE WHIPPING MAN. Photo by Debora Robinson. What always appeals to me first in theatre, above performance and production, is story. Coming from a playwriting background myself, I am always impressed when a playwright has the ability to truly surprise me with a reveal that was in front of my face the whole time. Matthew Lopez does just that, as well as perfectly pacing the play to ramp up to some very climactic pay offs in the second act, while still leaving the audience with the kinds of questions any good playwright should leave you with. I saw this play with my father, a Civil War history buff, who this morning was still thinking about the play. His thoughts really rang true for me. "Freedom is not so much about what an institution takes away from us, but what we take away from ourselves," he said. Throughout the play, both Simon and John raise the question, "Were we Jews or slaves?" Telling the story of a Jewish Confederate family certainly brought a fresh angle to an old tale, including some lightness when Simon quips to John that it could have been worse for them - they could have been on a Christian plantation. Drawing parallels between the Jewish experience and the American slave experience was an interesting entry point to a deeper discussion. But the faith part of the story was not what intrigued me the most. While each character is masterfully developed, the character of John was perhaps the most heartbreaking in that he is now a free man with no idea what to do or where to go. He loots from the neighbors' houses in what seems like an attempt at retribution, survival, and also exercising his new rights to own something, anything. And yet, his choices, both as a slave and now as a free man have continued to enslave him. By the same account, Caleb, who was always a free man, grapples with the same paradox. His choices have trapped him with a physical limitation, mentally with the anguish of his own guilt, and literally with a decision that keeps him imprisoned in his own home, a pile of ruins. 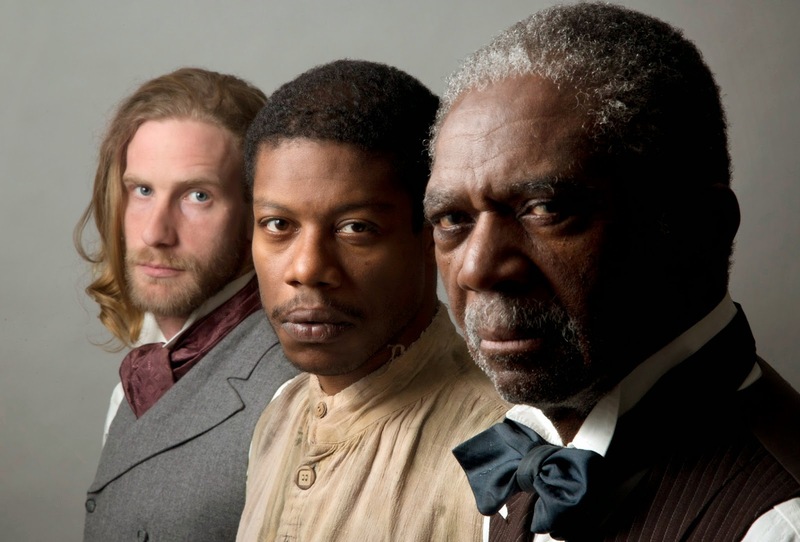 The Whipping Man balances the heavy material with humor and whiskey, while also exploring some incredibly huge questions about life, liberty, and the pursuit of freedom. Jarrod M. Smith, Adam Haas Hunter and Charlie Robinson in THE WHIPPING MAN. Photo by Debora Robinson. 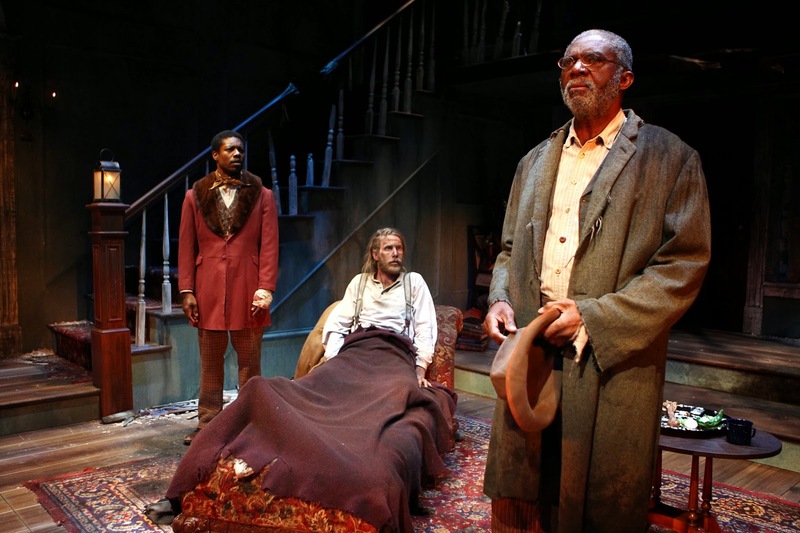 The Whipping Man runs through March 1, 2015 at the Pasadena Playhouse. Tickets van be purchased at PasadenaPlayhouse.org or by calling the Box Office at 626.356.7529.